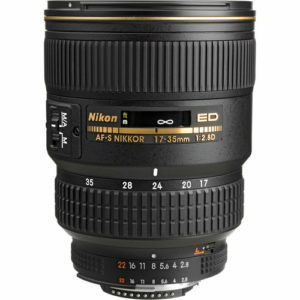 The AF-S Zoom-NIKKOR 17-35mm f/2.8D IF-ED is an ultrawide angle fast zoom lens designed for Nikon Full Frame Digital SLR cameras. It can also be used on APS-C (DX) bodies as well, but will yield an equivalent field of view as a 26-53mm lens on a full frame body. Thanks to the constant f/2.8 aperture this lens is a good choice for photographers who find themselves working in low light venues such as weddings and architecture. based on 318 user reviews online.